It’s no secret that Alaska is a place blessed with natural resources, but as tonight’s Frontline illustrates, when the interests of one industry are pitted against another, the state’s embarrassment of riches can seem like a curse. 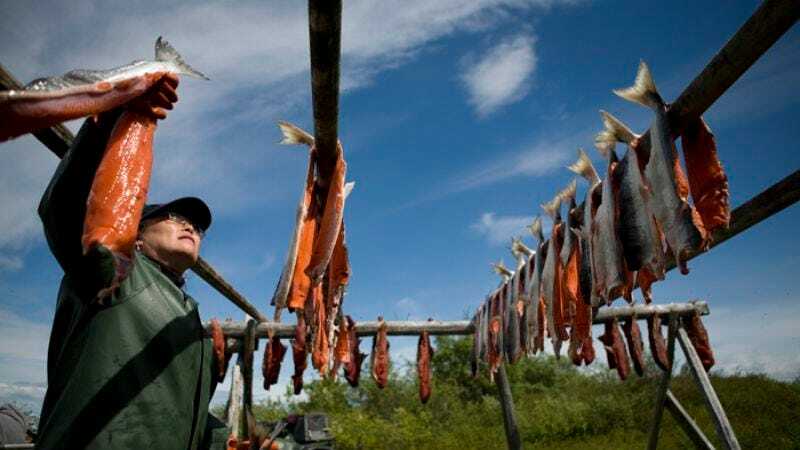 “Alaska Gold” explores the seemingly irreconcilable conflict between the salmon fishermen of Bristol Bay, and the deep-pocketed developers of a proposed copper mine that could very well disrupt the fragile ecosystem in which the salmon live. At the heart of “Alaska Gold” is an implicit question: What’s more valuable, the fish or the metal? It may not come as a huge surprise to learn that “Alaska Gold” is ultimately pro-fish, but there’s sufficient care given to the opposing argument that the report never feels like an environmental polemic. The situation itself seems like a cruel joke by Mother Nature. Smack dab in the middle of the pristine headwaters of Bristol Bay—which just so happen to function as vital spawning streams for several varieties of young salmon—sits the largest contained gold and copper deposit in all of North America. With over 80 billion pounds of high-grade copper and 100 million ounces of gold, the proposed mine would be worth somewhere between $200 and $500 billion—or more, depending on global demand for the metals. The mine isn’t just valuable financially; it’s also something of a natural wonder. We hear one young geologist gushing about the opportunity to work on a project this exciting, and she sounds a lot like the wildlife experts who study the nearby spawning streams. Even more miraculous are the salmon who continue to thrive in this well-preserved corner of North America. Not only do the pink-fleshed creatures provide vital sustenance to the bears, eagles, and killer whales of Alaska, but they’re also a key part of centuries-old human traditions. Of course, without the salmon, the commercial fishing industry would suffer enormously, but so, too, would the less lucrative subsistence fishing still practice by many Alaskan natives. For a minute or two, it seems as if the mine and the fish can, in fact, co-exist peacefully; even John Shively, CEO of the mining partnership, seems like a nice, reasonable guy, not a sinister Montgomery Burns type. But as the vast scale of the project becomes clear, a harmonious future seems increasingly unlikely. If built according to plan, the ironically named Pebble Mine, as it is known, will reach nearly mind-boggling proportions: an open pit two-to-three miles wide and a mile deep, plus a 700-foot-tall tailings dam to hold all the mine’s toxic wastewater in perpetuity. Copper mining is a messy business, even in a parched environment like Utah, home to the smaller but similarly designed Bingham Canyon Mine. But in a place like southwestern Alaska, where the earth is porous and tectonically active and the climate prone to storms, it’s potentially disastrous. Leached chemicals from the mine could disrupt the salmon’s precious habitat; a dam failure resulting from a flood or an earthquake could potentially wipe it out altogether. Despite vocal opposition from environmentalists, Native Alaskans, and salmon fishermen, the Pebble Mine seems all but inevitable. In an especially disheartening twist, part of the problem is the sheer scope of the project in a small, industry-friendly state like Alaska, which has never once failed to permit a mine. There simply aren’t enough knowledgeable regulators available to parse the 27,000-page environmental study released by Pebble, or to press the company to make its information available in a user-friendly format. At this point, the mine’s future rests with the EPA, which issued a gloomy assessment of the project’s potential environmental impact and could stop it altogether. In Anchorage, the EPA report was roundly condemned by Alaskans wary of government overreach. Hundreds of miles away in the fishing communities of Bristol Bay, however, it met with universal praise. “Big government” is a relative term.